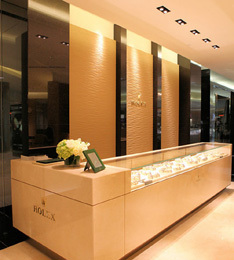 The brand has been sourcing gemstones since 1900. That’s a good sign when purchasing a future family heirloom. While in-house artisans will design custom pieces, the counters offer up dazzling creations from the world’s most recognizable designers, including David Yurman, Ivanka Trump, and Mikimoto. An extensive collection of timepieces includes watches from Breitling, Chanel, and Omega.